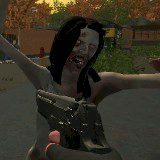 You have no other choice, but kill those zombies or you die. Shoot em in the heads! Kill zombies and survive the level. Get points and upgrade your equipment to face another challenge and resume the game!